Jeff Green picked up the 64th last-place finish of his NASCAR XFINITY Series career in Friday’s ToyotaCare 250 at the Richmond International Raceway when his unsponsored #10 TriStar Motorsports Toyota fell out with rear gear issues after he completed 2 of the race’s 250 laps. The finish was Green’s 4th of the 2015 season and his first since Fontana, three races ago. It occurred in Green’s 398th series start. 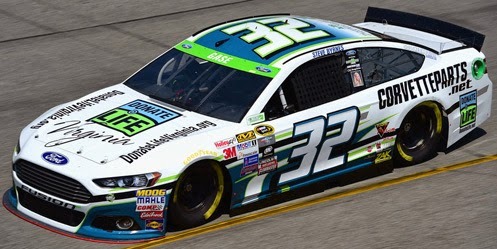 Green joined an entry list of 42 drivers in what would become his first weekend of successfully pulling double-duty at the same track since October 2010 at Charlotte, where he ran the XFINITY Series race for TriStar and the Cup event for Larry Gunselman Motorsports. Hours before the race, Green had handed The Motorsports Group its first Cup start since Atlanta in March by securing the 33rd starting spot, bumping Jeb Burton from the field. Green would finish 40th in Sunday’s rain-postponed event, his first Cup start since New Hampshire in July 2011. Back in TriStar’s XFINITY Series ride, Green managed just 38th in the only practice session, but made it into the second round of qualifying with the 23rd-fastest time of 121.951 mph. Green, along with JD Motorsports’ Harrison Rhodes in the #0 teamjdmotorsports.com Chevrolet, did not participate in the final rounds of qualifying. Thus, Green settled for 24th with Rhodes in 23rd. Missing the race were Johanna Long, who was attempting to get defending Eldora Truck Series last-placer Mike Affarano into his first XFINITY Series race, and Atlanta last-placer Morgan Shepherd. At the start of Friday’s race, 40th belonged to last-place starter Mike Harmon, who looked to be following up his last-place run at Texas when he lost touch with the field in the early laps. 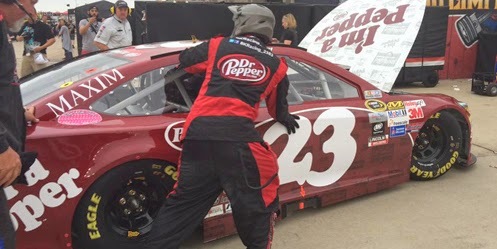 Though 2 seconds behind the field, he was passed by Green, who pulled into the garage area after 2 laps. Harmon followed suit the next time by, giving the two drivers the final spots in the field. 38th and 37th went to Derek White’s team cars, this week driven by Timmy Hill (#13 Braille Battery / Grafoid Toyota) and Carl Long (#40 Braille Lithium Battery / Sweet ‘n Surf Dodge). Both retired without incident during the first 43 laps. Rounding out the Bottom Five was Eric McClure, whose fuel pump issues didn’t remove his #24 Hefty Toyota from the event until after 205 of 250 circuits. 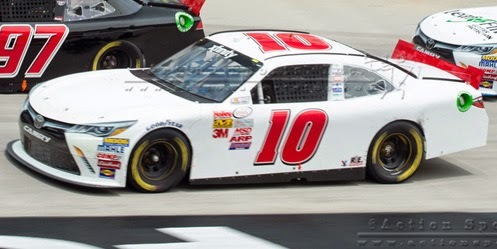 *This was Green’s first last-place finish in an XFINITY Series race at Richmond since April 26, 2013, when his #10 TriStar Motorsports Toyota had a vibration after 4 laps. That race was also his third-consecutive last-place run at the track - a streak ended in September by J.J. Yeley and The Motorsports Group. *This marks the first time an XFINITY Series driver has ever finished last due to rear gear issues. Derek White picked up the 1st last-place finish of his NASCAR XFINITY Series career in Saturday’s Drive to Stop Diabetes 300 at the Bristol Motor Speedway when his #40 Braile Battery / Grafoid Dodge fell out with electrical issues after he completed 11 of the race’s 300 laps. The finish occurred in White’s 14th series start. The 2010 NASCAR Canadian Tire Series Rookie of the Year, White made his XFINITY Series debut at his home track at Montreal in 2012, where he finished a career-best 18th driving the #24 Boutique Fashion Broker Chevrolet for SR2 Motorspots. In last year’s running of this same Bristol race, White debuted his own team with Matt Carter as the driver of his #13 Toyota. The team, Motorsports Business Management (MBM) made six more starts by season’s end, not finishing any of those races, and planned to expand into a two-car team for 2015. This year, White and journeyman co-drivers Chris Cockrum, Carl Long, Cody Ware, and Timmy Hill have each shared time in MBM’s #13 and #40 Toyotas and Dodges. Cockrum gave the team its best finish to date at Daytona, running 21st in the #13 right in front of White in the 22nd. 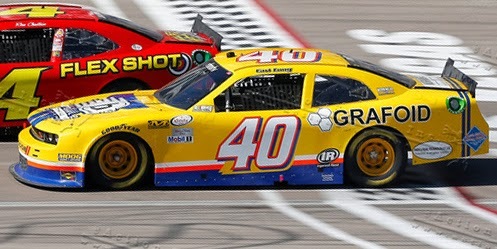 The team’s #40 then finished next-to-last in four of the next five races, again with White sharing his ride with Long. At Bristol, Long timed in 37th-fastest of the 39 drivers during the opening session, and both Long and White moved the #40 up to 36th out of 39 in Happy Hour. White secured the 40th and final starting spot based on owner points, joining Texas last-placer Mike Harmon as the only two Dodges in the field. Eleven laps into the race, White pulled off the track under green, taking last from Eric McClure, who crashed in Turn 4 on Lap 2. Finishing 39th, 17 laps behind White, is current three-time last-place finisher Jeff Green. Atlanta last-placer Morgan Shepherd ended up 38th followed by Derrike Cope with his third bottom-five finish of the year and Carlos Contreras, making his season debut in Rick Ware’s #15 BYB Extreme / Dawg-Fight.com Chevrolet. 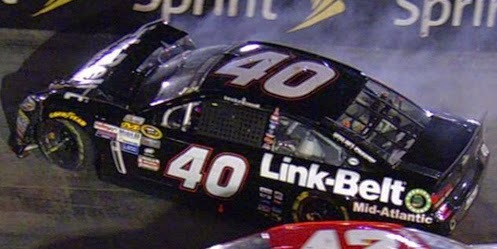 *This is the first last-place finish for the #40 in the XFINITY Series since February 20, 1999, when Kerry Earnhardt’s #40 Channellock Chevrolet started 7th, but fell out with handling woes during the Alltel 200 at North Carolina (Rockingham) Speedway. The number had not finished last in a series race at Bristol since April 12, 1997, when Curtis Markham’s MHCO USA Ford crashed after 14 laps of the Moore’s Snacks 250. 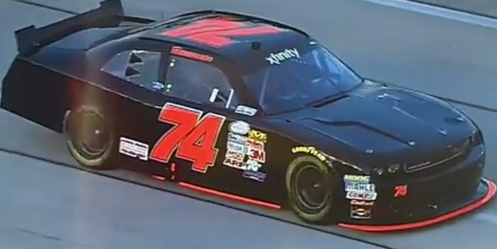 Mike Harmon picked up the 14th last-place finish of his NASCAR XFINITY Series career in Friday’s O’Reilly Auto Parts 300 at the Texas Motor Speedway when his #74 Absolute Machines Dodge lost the engine after 2 of the race’s 200 laps. The finish was Harmon’s first of the 2015 season and his first in the series since June 16, 2012, when Harmon’s #74 West Virginia Miners Baseball Chevrolet fell out with a vibration after 1 lap of the Alliance Truck Parts 250 at Michigan. In the 93 races since that Michigan finish, Harmon has made just 38 starts, choosing instead to have other journeyman drivers run his black Chevrolets and Dodges. In 2013, Harmon’s team made all but five races using the employ of Kevin Lepage, Juan Carlos Blum, Danny Efland, Kevin O’Connell, and Carl Long. Harmon finished 17th in the season-opening Daytona race that year, and returned in 2014 to run 14 of the team’s 26 starts. The team’s best finish of 2014 went to dirt tracker Bobby Reuse, who came home 24th at Mid-Ohio while brother Roger trailed in Harmon’s second car, #77. Coming into Texas, Harmon had qualified for and started all 5 XFINITY Series races with a season-best 24th that again came at Daytona. However, with 3 DNFs coming into Texas, Harmon was ranked just 25th in points. Harmon was one of 39 drivers on the preliminary entry list for Texas, but on April 3, Viva Motorsports added a late entry with Brandon Gdovic in the team’s #55 Chevrolet, securing a full field of 40. In the opening practice, Harmon timed in 37th of the 38 who took time (behind Derek White in the former #13 Braille Battery / Grafoid Dodge, now renumbered #40), then ran the slowest of the 40 in Happy Hour. In qualifying, he secured the final starting spot as the only driver to not complete a qualifying lap. In the final pace laps before the race, Harmon and 39th-place starter White were joined by Jeff Green, who was set to equal his August 2011 record as NASCAR’s first four-time last-place finisher, and both Joey Gase and outside-polesitter Brad Keselowski, who all made unapproved adjustments prior to the race. Harmon’s team had also been tinkering with the car after qualifying, though without further consequence. Just two laps into the race, Harmon’s Dodge lost the engine in Turn 4, bringing out the first caution of the night. With no one yet out of the event, Harmon secured the 40th spot, denying Green his four-peat. White pulled out of the race three laps later, giving his #40 its third-straight next-to-last place finish. Green exited three laps after White to finish 38th followed by Stanton Barrett in Rick Ware Racing’s #15 Lily Trucking / 4caring.org Ford. Rounding out the Bottom Five was Derrike Cope, who on Lap 79 lost the engine on his #70 Nature Nate’s Honey / Zilla Wraps Chevrolet. *This is Harmon’s first XFINITY Series last-place finish at Texas since April 5, 2008, when his #84 James Otto / Muzik Mafia Chevrolet overheated after 13 laps of the O’Reilly 300. *This is the first XFINITY Series last-place finish at Texas for the #74 since April 3, 2004, when Tony Raines’ Outdoor Channel Chevrolet was involved in a three-car accident after 1 lap of the O’Reilly 300. *This is the first XFINITY Series last-place finish by a Dodge at Texas since November 6, 2010, when Dennis Setzer’s #92 K-Automotive Motorsports Dodge fell out with a vibration after 3 laps of the O’Reilly Auto Parts Challenge.